The trail curled around a slope and revealed an oasis by the sea, complete with palm trees heavy with coconuts, sheltered tidal pools and the wildly pounding surf of the Pacific Ocean. Hello Halape. Welcome to Paradise. Halape is a campground in Hawaii Volcanoes National Park on the Big Island of Hawaii, just miles from the southernmost point in the U.S. 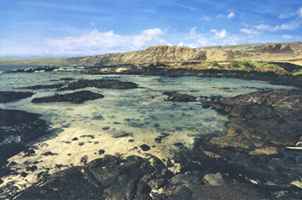 It's one of the few camping points along the park's Puna Coast Trail. It's not a safe place to live. Native Hawaiian coastal villages were abandoned 150 years ago following a series of devastating tsunamis. Earthquakes are common, so if hikers or campers feel a quake, they're supposed to literally head for the hills to avoid possible tidal waves. It had been an eight-mile backpack, an elevation drop of about 2,600 feet, down the Ka'aha trail from the Mau Loa O Mauna Ulu trailhead off the Chain of Craters Road. The route began its descent down desolate chunky lava fields before cutting into scraggy forests and winding around passages in the Polo Keawe Pali. Pali is the Hawaiian word for cliff, and the razorback cliffs are common along many of the islands' coastlines. My daughter, Molly, who was working at the park, led the way while I ambled behind. I was savoring the scenery, variable geology and quirky weather. At times the wind blasted horizontally, sometimes we were suddenly soaked by rainsqualls, but often the clouds cleared and temperatures turned warm and humid. Halape has a primitive three-walled shelter that serves as a haven during storms, and, like some shelters along the Puna Coast, has a catchment water tank. That water is especially necessary during hot weather, when dehydration, sunstroke and heat exhaustion are serious problems. We only peeked at the shelter, then headed for the beach, where we claimed a white sand seaside camping spot alongside a natural lava rock wall that served as a valuable windbreak. Within minutes we had unpacked, grabbed our snorkels and submerged ourselves in a shallow, protected tidal pool, where we watched an incredible display of oddly shaped, brightly colored fish and occasional coral. I nearly swallowed a mouthful of water when I came face-to-face with an evil-appearing eel that was tucked underneath a rocky ledge. When wed finished snorkeling we hiked to a nearby lesser-developed area. Pieces of bone-white coral showed the way across hardened lava flows to another beach with a sheltered cove, coconut palm trees and some brackish fresh water ponds. Nearby, too, were hand-carved tikis and a papamu, or stone playing surface, used for a traditional Hawaiian game called konane. It felt like a slice of Eden, especially when two people emerged from a tent sporting full-body tans. with abundant variety of fish. Back at camp Molly and I pried layers of husks off coconuts that we had knocked off trees. We poked holes in the coconuts and slurped out the tasty, sweet juice, then carved out the ball-shaped inner shell, which held the rich meat. We spent the night in tents to avoid pestering cockroaches and in the morning enjoyed several lazy hours of hiking and snorkeling. 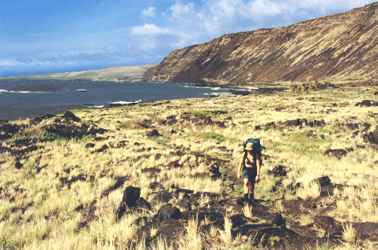 Later that morning we pulled camp and began the 12-mile hike east along the coast past the Keauhou and Apua Point campsites. At Keauhou, after boiling and refilling our bottles with water from a catchment tank, we detoured a half-mile to the coast and explored a Fantasy Island-like maze of bays and ponds. Twisted, contorted lava flows fronted the ocean edge. The last nine miles of trail angled through fields of deep black lava. To the north the walls of the distant Holei Pali were frequently darkened where rivers of molten lava had poured from the uplands. The best flows featured incredible mixes of textures, some like petrified sand, others like massive fields of shattered porcelain patterned with shiny gold plating. Traveling over the thinly layered surface was like walking over crunchy potato chips. Poking out of the bleak chaos from frequent splits, fractures and deep fissures were sturdy sun-seeking ferns. East of Apua Point the trail paralleled high coastal cliffs, where waves occasionally showered us with exploding sea foam. The ragged coastline is spectacular with frequent arches and blowholes. Molly bounded from ahu (rock cairn) to ahu. The tall markers are necessary because the region from Keauhou east to our exit point at Pu'u Loa consists of endless lava fields. Mauna Ulu, eight miles north, had kicked out a huge lava shield between 1969 and 1974. It was nearly dark when we reached the parking area, where we hitched a ride back up the Chain of Craters Road to our car. The hiking had been rigorous and challenging, the scenery varying from bleakly desolate to beautifully stunning. It wasn't Paradise Lost, but Paradise Found. For nearly two weeks we explored the Big Island's many and varied sights. Whenever we neared the ocean, I searched for sea turtles. On our backpack trip, Molly and I had watched for rare hawksbill turtles. Later, on a snorkeling trip with my wife, Mary, and Molly, we visited two of the Big Island's best known snorkeling sites, Pu'uhonua o Honaunau and Kealakekua Bay. Our tour leader from Sea Quest Rafting Adventures told us to watch for green sea turtles, but we saw none. That didn't detract from our trip, a four-hour adventure that included a flying boat ride flanked by jumping fish and side trips to sea caves and lava tubes. Coral beds and colorful fish. 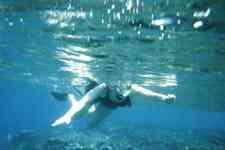 Mary snorkels in Kealakekua Bay. 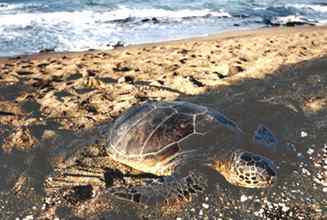 Several days later, during an afternoon stroll along the beach at Kahuwai Bay, in front of the fantasyland-like Kona Village Resort, I nearly tripped over rock-backed green turtles plopped in the sand. Green turtles, which are found in warm, coastal waters, often spend afternoons on sandy beaches basking in the sun. Molly, who had seen many green turtles, chuckled as I tiptoed closer, camera at the ready. "You can get closer Dad," she instructed. So I did. A day later, Mary and I watched goggle-eyed from the resort's Kaupulehu beach as waves of turtles floated onto the beach. The turtles awkwardly rode waves onto the beach. Then as succeeding waves swept the shore, the turtles tumbled slowly and slightly forward. When incoming waves no longer provided a boost, the turtles clumsily inched forward. They lifted themselves on their two front flippers, rose slightly above the sand, and then unceremoniously flopped forward. As they repeated the process they left a sandy trail. Green turtle flops along the beach. Large, heavy and hefty, the shells of a typical green turtle are more than 3-feet long and weigh 200 to 300 pounds. Really big greens are 4-feet long and weigh upwards of 800 pounds. Their size, weight and awkwardness on land make them especially vulnerable, and oddly lovable. They rest on the beach, but the ocean, where they mainly feed on marine grasses, is their home. And, because they are reptiles, while in the water the turtles periodically rise to take quick breaths before again submerging. That night we enjoyed a lavish dinner and the luxury of a resort condo. 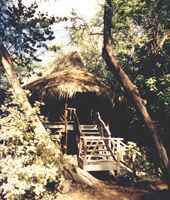 The Kona Village features 125 thatched South Pacific-style hales, or huts. No phones, no TVs, no radios. Some condos are along the beach; others are just back from low, rugged black lava sea cliffs; and some surround tranquil fresh water ponds. The next morning, our last on the Big Island, we visited the beach, where Mary claimed a seaside chair and I checked-out fins and goggles. 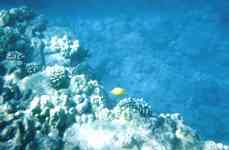 I followed other snorkelers along a rocky cliff where, within seconds, the underwater scene was pulsating with a variety of fish: butterfly fish, wrasse, Achilles tangs, parrotfish, angelfish, damselfish, puffers, trumpet fish, and sea urchins. It was like swimming in an aquarium. I changed direction and swam parallel to the beach. At first glance I saw what looked like a partially submerged rock. At second glance I realized I was only a few feet from a turtle partially obscured by the wind-stirred waters. Amazed and thrilled, I swam in a wide arch, gradually moving closer. One, two, then three turtles bobbed about, their flippers seemingly haphazardly fluttering. Imitating their motion, I held my breath, and then slowly sunk and let my arms hang loose. I followed them to the surface as they floated upwards, raised their heads and sucked quick breaths. For nearly an hour I swam with the turtles. Another big thrill on the Big Island. 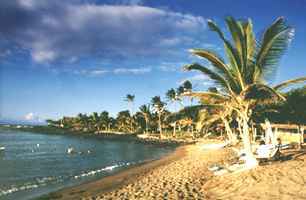 Click here for details to plan your own trip to the Big Island, Hawaii.